29 years ago, when I started out in ministry, I was taught and adopted a ministry strategy that said, "the more ministries you have, the more people you will reach." I took this to heart and tried to cram as much on the ministry calendar as I could. But for some reason, it didn't work. It seemed the more quantity I added to the ministry, the less people I was able to reach. Why did that happen? Because the reality is, the more you add to your ministry calendar, the less you will accomplish. When it comes to ministry strategy, less is more. Does that mean you sit back and are lazy? No. No, but what it does mean is you focus your time, energy, resources and effort into a few events and programs. It means you find your niche' and work hard in that area. The best thing you can put on your ministry calendar may be some eraser marks. Here's an example of this principle from the retail world. 11 years ago, McDonald's stopped growing. The fast food store felt like the reason behind the stall was its limited menu. And so they tried out lots of new items and doubled their amount of food choices. The result? Their sales remained flat. In 2016, they decided to go back to the basics. They dropped the additional menu items and started offering breakfast items more often. The result? Sales jumped and went up 6% in 2017. And stock rose by 40%! Through this, they discovered that customers didn't want a broad offering of food, but simply more of what they already liked. Simplicity and focus is what costumers responded to best. A more complex menu meant it took longer for costumers to get their food. In a recent poll, 64% of customers say they would rather have a simple, convenient experience. And that mindset flows right into their experience at church as well. 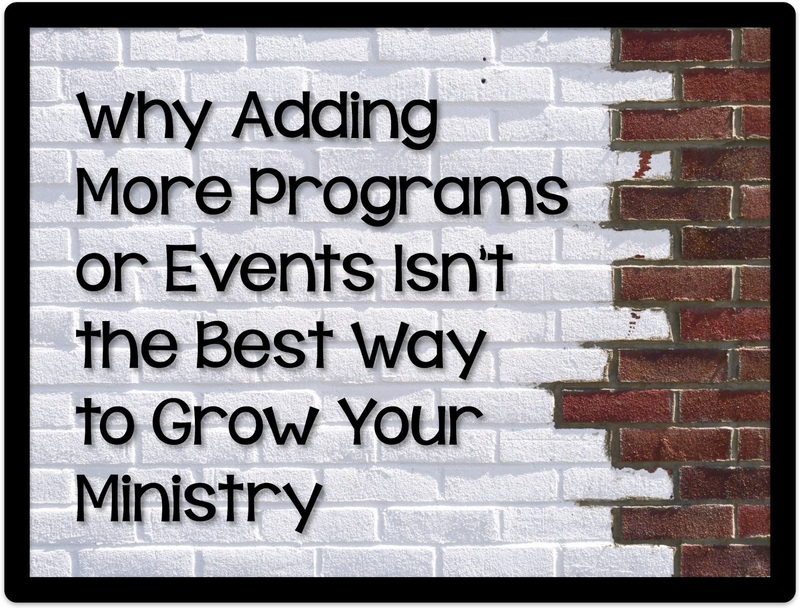 Don't give into the temptation of filling up your ministry calendar with events and programs. Find what your ministry does best and poor your effort into that. Focus the abilities of your volunteers into serving in a few, strategic programs and events. Focus your budget on what is working best. Strengthen your volunteer team by not spreading them too thin across a wide variety of ministry offerings. Finally, remember that being busy doesn't necessarily equate to success. When you analyze your ministry events and programs, don't measure success by busyness, but rather by productivity. For years, I've tried to live by the blank piece of paper test. I take every ministry...every event...every program and put it to the blank piece of paper test. It's a simple, but powerful test. Here it is...a year after the program, event or ministry has taken place, can I write down on a piece of paper the names of people and families that have been reached through it and are now part of our church family. If I can't write down any names, then that ministry, event or program has failed the blank piece of paper test and needs to be adjusted or dropped. Our goal is to reach and disciple kids and families, right? Then we must make sure that what we are doing is clearly leading us to accomplish that goal. Your turn. Do you believe less is more? Should ministries do less and focus more on a few things? Share your insight and ideas in the comment section below. This is so challenging. And good. I finished reading Thom Rainer's SIMPLE CHURCH book a while back, and one of his suggestions for "events" is to fold them into what you already do. Instead of having a separate harvest festival, incorporate it into your mid-week or weekend ministry. Instead of doing a special Christmas program, incorporate it onto your Sunday morning. And above all, make sure you have a next step in mind for each event or program. What are they headed to next? What do you want that family to be invited back to? Think about the end before you start programming, and it reaps dividends. Great insight Shaun, thanks for sharing. I agree with that strategy and have seen it work.